Boston Light, the oldest light station and second oldest lighthouse structure in the USA. The state of New Hampshire only has two lighthouses both of which are located along the Atlantic coastline. "Historic Light Station Information and Photography: New Hampshire". United States Coast Guard Historian's Office. "Historic Light Station Information and Photography: Vermont". United States Coast Guard Historian's Office. 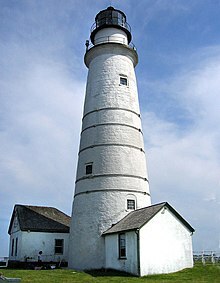 Sandy Hook Lighthouse is the oldest still standing in the United States. 105 ft (32 m) 015Craighill Channel U.R.F. Minnesota 070Duluth South Breakwater I.L. Clover Island Lighthouse (built 2010), in Washington is the first to be built in the United States since 1962. One of only two remaining lighthouses built during Japanese occupation. This table lists lighthouses that are in insular areas of the United States. All of the islands listed below are uninhabited, and have not been formerly incorporated into the country. Crompton, Samuel Willard & Michael J. Rhein, The Ultimate Book of Lighthouses (2002) ISBN 1-59223-102-0; ISBN 978-1-59223-102-7. Jones, Ray & Bruce Roberts, American Lighthouses (Globe Pequot, September 1, 1998, 1st Ed.) ISBN 0-7627-0324-5; ISBN 978-0-7627-0324-1. Jones, Ray,The Lighthouse Encyclopedia, The Definitive Reference (Globe Pequot, January 1, 2004, 1st ed.) ISBN 0-7627-2735-7; ISBN 978-0-7627-2735-3. Noble, Dennis, Lighthouses & Keepers: U. S. Lighthouse Service and Its Legacy Annapolis: U. S. Naval Institute Press, 1997. ISBN 1-55750-638-8; ISBN 978-1-55750-638-2. Roach, Jerry, Ultimate Guide to Great Lakes Lighthouses, (2003). Thurston, Harry,Against Darkness and Storm: Lighthouses of the Northeast (Halifax: Nimbus, 1993). U.S. Coast Guard, Historically Famous Lighthouses (Washington, D.C.: Government Printing Office, 1957). Weiss, George, The Lighthouse Service, Its History, Activities and Organization (Baltimore: Johns Hopkins Press, 1926). A.^ The shortest lighthouse in Massachusetts is either Palmer Island Light at 24 ft (7.3 m), or Brant Point Light at 26 ft (7.9 m). Sources remain split on this issue with at least one claiming the latter as the shortest in New England. B.^ The Perry Monument in Ohio, and the Statue of Liberty in New York City are not classified as lighthouses. They would come in as the two tallest lighthouses in the United States otherwise. C.^ Minnesota Point Light was built in 1858, but only half of the now ruined tower remains. D.^ The oldest light station is Pottawatomie Light which was established in 1836, the current buildings though date to 1858. E.^ The shortest height is for a skeletal tower which was placed in 1981. For "traditional" lighthouses, Point Retreat Light and Cape Spencer Light are tied at 25 ft (7.6 m) each. F.^ These two lighthouses are tied at 115 ft (35 m) each. G.^ The oldest lighthouse in Hawaii was called "Lahaina lighthouse", which was built in 1905 before it was replaced. Moloka'i Light is the oldest currently standing lighthouse, it was first lit a month before the still standing Makapuu Point Light. H.^ Pass A L'Outre Light was originally constructed in 1852 elsewhere and moved to its present location. I.^ Cat Island Light (First tower), Pass Christian Light, and Ship Island Light were all 30 feet tall. ^ a b c d e f g h i j k "Lighthouse Listing By Tower height". www.us-lighthouses.com. Retrieved September 14, 2017. ^ a b "The Oldest Lighthouse in Each New England State". New England Historical Society. Retrieved August 27, 2018. ^ RJ Heller (May 8, 2018). "Fog and lighthouse as mother and father". Bangor Daily News. Retrieved August 27, 2018. ^ "Oldest U.S. lighthouse, the Boston Light, celebrates 300 years". Accociated Press via Navy Times. September 14, 2016. Retrieved August 27, 2018. ^ "Isles of Shoals (White Island) Lighthouse". Lighthouse Friends. Retrieved August 27, 2018. ^ "Lighthouses of Rhode Island MPS (PDF pages 46-50)" (PDF). Rhode Island Preservation. Retrieved 2014-11-10. ^ a b Susan Hodara (15 August 2014). "Taking In the History of New London, a City Shaped by the Sea". The New York Times. ^ Marlo Jappen (July 22, 2015). "Secrets of the Fire Island Lighthouse". Newsday. Retrieved August 27, 2018. ^ Unknown Author (March 11, 2011). Lighthouses of the Mid-Atlantic Coast. Voyageur Press. p. 145. Retrieved August 27, 2018. ^ Linda J. Barth (June 25, 2018). New Jersey Originals: Technological Marvels, Odd Inventions, Trailblazing Characters & More. Arcadia Publishing. p. 86. Retrieved August 27, 2018. ^ Francis Ross Holland (January 1, 1988). America's Lighthouses. Courier Corporation. p. 11. Retrieved August 27, 2018. 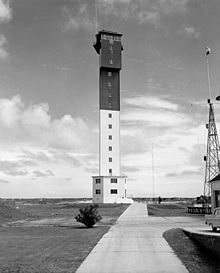 ^ "Liston Range Rear Light, DE". Kraig Anderson. Retrieved September 17, 2017. ^ Unknown Author (March 11, 2011). Lighthouses of the Mid-Atlantic Coast. Voyageur Press. p. 149. Retrieved August 27, 2018. ^ "Craighill Channel Lower Rear Lighthouse". Lighthouse Friends. Retrieved September 20, 2017. ^ "Historic Light Station Information & Photography Maryland". United States Coast Guard. Retrieved September 20, 2017. ^ "Lighthouses of the United States: Maryland Western Shore". www.unc.edu. Retrieved September 17, 2017. ^ "No two lighthouses are alike". Tri County Times. June 29, 2017. Retrieved September 29, 2017. ^ "Old Lighthouse Museum oldest in Indiana". The Michigan City News Dispatch. August 14, 2014. Retrieved September 4, 2018. ^ "Fort Gratiot Lighthouse". PH Museum. Archived from the original on March 19, 2011. Retrieved September 4, 2018. ^ Martin Hintz (2003). Minnesota Family Weekends. Big Earth Publishing. p. 78. Retrieved September 4, 2018. ^ "Northwood, OH". Lighthouse Friends. Archived from the original on March 31, 2014. Retrieved September 28, 2017. ^ "Marblehead Lighthouse". Lighthouse Friends. Retrieved September 4, 2018. ^ Ken Wardius, and Barb Wardius (2000). Wisconsin Lighthouses: A Photographic & Historical Guide. Big Earth Publishing. p. 72. Retrieved August 27, 2018. ^ "Eldred Rock Lighthouse". Sheldon Museum. Retrieved September 4, 2018. ^ "Yaquina Head Lighthouse". Bureau of Land Management. Retrieved November 11, 2014. ^ "Inventory of Historic Lighthouses - Sand Island". National Park Service. Retrieved 2008-02-18. ^ "Inventory of Historic Lighthouses - Mobile Middle Bay". National Park Service. Retrieved 2008-02-18. ^ "Inventory of Historic Lighthouses - Cedar Keys". National Park Service. Retrieved 2008-05-06. ^ "Palmer Island, MA". Lighthouse Friends. Retrieved August 28, 2018. ^ "Palmer Island Light Station". National Park Service. Retrieved August 28, 2018. ^ Ray Bartlett (June 14, 2016). Moon Cape Cod, Martha's Vineyard & Nantucket. Avalon Publishing. Retrieved August 28, 2018. ^ Amy Jenness (October 7, 2014). On This Day in Nantucket History. Arcadia Publishing. Retrieved August 28, 2018. ^ Dave Wobser. "Perry's Memorial Monument". lighthouse.boatnerd.com. Retrieved August 27, 2018. ^ "Minnesota Point, MN". LighthouseFriends. Retrieved September 4, 2018. ^ "Pottawatomie (Rock Island) Lighthouse". Lighthouse Friends. Retrieved October 16, 2017. ^ "Lahaina Lighthouse". Lighthouse Friends. Retrieved August 27, 2018. ^ "Makapu`u Lighthouse". Lighthouse Friends. Retrieved October 16, 2017. ^ "Moloka`i (Kalaupapa) Lighthouse". Lighthouse Friends. Retrieved October 16, 2017. ^ Lighthouse Board; Homans, Isaac Smith (November 24, 1856). Northeast Pass Lighthouse; Mouths of the Mississippi River. Hunt's Merchants' Magazine and Commercial Review. 36. p. 367. Retrieved September 6, 2017. ^ Rowlett, Russ. "Lighthouses of the United States: Louisiana". The Lighthouse Directory. University of North Carolina at Chapel Hill. Retrieved September 5, 2017. Lighthouses in the National Park System. Light List, Volumes 1-7. United States Coast Guard. Interactive map of lighthouses all over the country. Wisconsin Historical Society, antique photographs of Wisconsin lighthouses. Bibliography on Michigan and other lighthouses. Detroit News, Interactive map on Michigan lighthouses. Wagner, John L. Beacons Shining in the Night, Michigan Lighthouse Bibliography, Chronology, History, Keepers Lives, and Photographs, Clarke Historical Library, Central, Michigan University. Wikimedia Commons has media related to Lighthouses in the United States. This page was last edited on 3 December 2018, at 00:22 (UTC).